​CEP's "G" Series Portable Power Distribution Centers have been engineered utilizing the latest in GFCI technology, providing the user with the highest level of electrical safety. These power distribution centers are protected by a GFCI module giving the user open neutral and reverse phasing protection. They are U.L. Listed for outdoor use and designed to stand up to the tougest of jobsite conditions. Each unit has been carefully assembled to provide the ultimate in electrical safety as well as meeting current OSHA standards. Input current: 50 amp 1 phase 125/250 volt A.C. 3 pole 4 wire. Trip Level: 4-6 milliamps. Trip Time: Less than .025 seconds nominal. Chassis: 16 gauge steel. Top: 14 gauge steel. Legs: 10 gauge steel. Finish: 3 mils U.L. listed polyester powder coat. Dimensions: W=14.5" L=21" H=11". 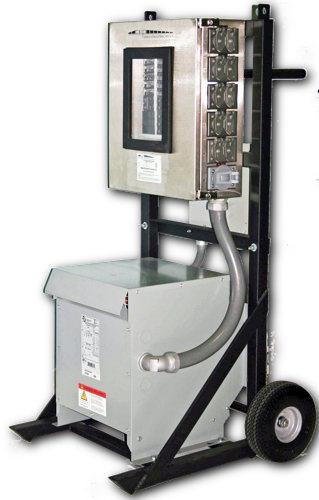 These heavy-duty 3 phase power distribution carts are designed to breakdown 3 phase 120/208V power into 208V 3 phase, 250V single phase and/or 125V single-phase power. The power supply input may be a direct wire feed, 100A pin and sleeve, or cam type devices. Either a large generator or another large power source may power them. These panels may be designed to act as the feeder for the smaller spider type boxes or wired for powering large equipment. The cart is made of heavy gauge tube steel and provides an easy means of transportation as well as protection for the enclosure. The enclosure is custom built from 16 gauge sheet metal. 100A, 200A, 400A and special configurations are available upon request. Model No. Main Breaker Rating/Input Type Output Receptacles Approx Wt.